I'm using the same drivers, SE runs fine for me. It works correctly for me. Are you using the current version? Also, what software are you using to view the exported map? Keep in mind that land areas will have a fully transparent alpha channel unless you also export a specular map (so it's best to export the spec too just to save a processing step on the diff map if you don't want transparency on it). um, idk what version mine is, and im using paint to open the image. im trying to get the texture thing of how it looks to use on a planet in a mod for another game. It tells you on the splash image when opening the program, and it tells you on the main menu. If it's not 0.9.7.1, you should update. Also, did you take my advice and try exporting the specular map along with the color map? 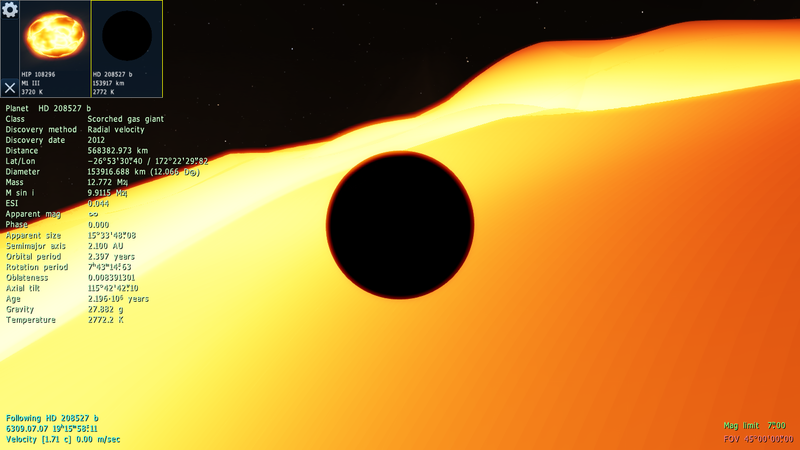 Whenever I'm around a small galaxy (1000 or fewer parsecs wide), Space Engine slows down dramatically, and sometimes crashes due to the load. 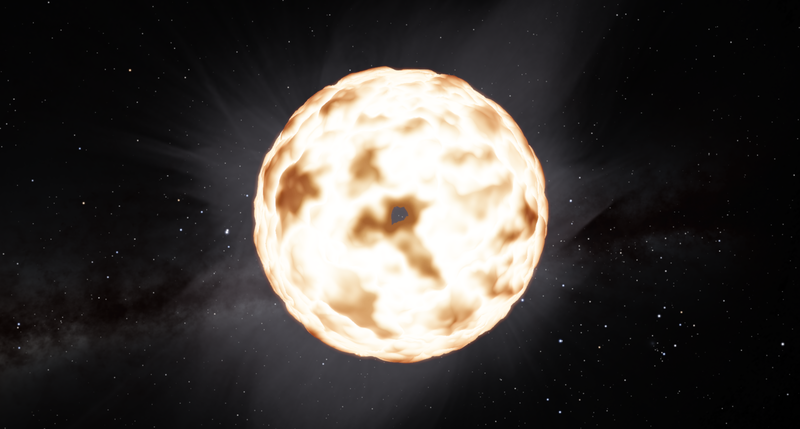 Is this merely a symptom of rendering many stars, or is there something else going on? That sounds very odd... But if it's fixed, that's great. I mean... Are you in Windows 8? And according to Wikipedia, HD 208527 get an apparently wrong diameter, which makes HD 208527 b fade into it sometimes. Cesrate, you don't need to make a new thread for every issue you have. Things like this can be posted here. Hi, I'm having this problem where the planetary rings tend to "clip" through the spaceship I'm flying. My graphics card is an ASUS HD7970 if that has anything to do with it (the same thing occurred with my HD 6850). 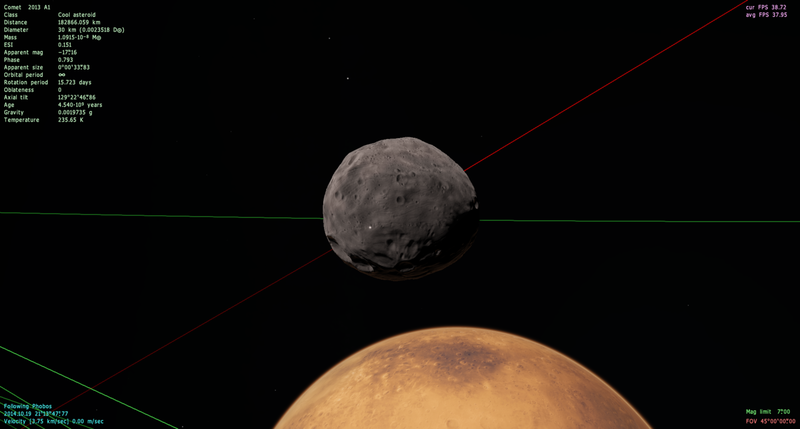 This problem has persisted since ships were introduced into Space Engine. I'll upload an image if anyone is having any trouble understanding my problem. Thanks. This is a known issue, and it doesn't just happen with spaceships, it also happens with moons. You can see a list of known issues here. That is also where you should have made your post, a new thread was not necessary.